Here’s a model I developed organically through working with clients worldwide during the turbulence arising after the 2016 U.S. presidential election. The Spheres of Inner Resilience came into its current form in early 2017 and has been a handy tool for staying centered and effective in times of tremendous change. Resilience is the capacity to withstand stretching and recover quickly from challenging conditions. It requires self-awareness, flexibility, and dynamism. Inner resilience has direct influence on our composure, as well as our ability to cope with and respond to whatever comes our way. 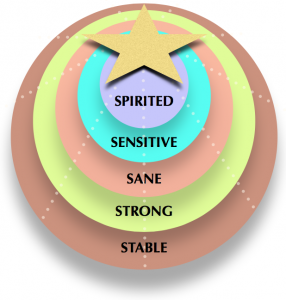 STABLE – Grounded in the present, in touch with the emotional experience of safety and security. Not easily disturbed. STRONG – Embodying one’s authority. Connected to a robust sense of authentic and benevolent power and support. SANE – Lucid, right-mind balance. Open and receptive to wisdom. SENSITIVE – Able to detect and respond to subtle changes, signals, influences. Careful thought with considerate appreciation of feelings. SPIRITED – Passionate and purposeful. Energized with vitality. 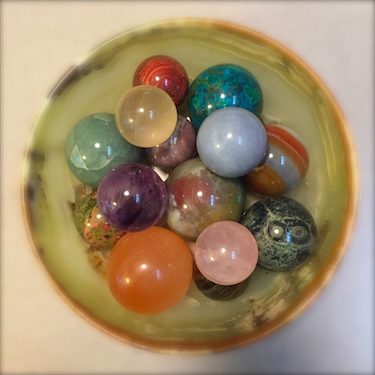 These spheres are expanded or diminished consciously and unconsciously. When combined, they support and enhance one another. When one or more become severely out of balance, inner resilience is compromised. The demands of our ever-changing world require us to be more and more resilient. The synthesis of an inner core rich with stability, strength, sanity, sensitivity and spirit cultivates emotional intelligence and empathic fluency. Developing inner resilience gives us the ability to lead our lives with greater ease, responsiveness, and mastery. © 2017 Gail Barrie, CPCC – All rights reserved.